SUBSCRIBERS ARE THE FIRST TO KNOW OUR UPCOMING KICKSTARTER LAUNCH DATES AND MORE! For those that are already subscribed, thank you! Our goal for 2018 and beyond is to reward subscribers with the latest and best content first. With that in mind, for our upcoming Reign of Terror: The Protoan Kickstarter campaign, we are holding off on early public launch date announcements on our social media channels. Subscribers will be the first to learn about the date and time Reign or Terror: The Protoan will go live. Technically, the launch date will be before the end of March. Of course, a public announcement for the launch will have to be made, but it will be typically held off until the day before we launch. Whereas, subscribers will be notified days before. In addition, we're working on future plans to reward our subscribers with additional digital downloads and merchandise unlocks who are subscribed before each Kickstarter launch. Stay tuned for additional announcements and make sure to subscribe! Based on the feedback we received from our community, as well as the art requirements needed to meet the needs of the larger expansion, Reign of Terror is being offered in two installments. Reign of Terror: The Protoan is the first installment. Depending on the success of the Protoan expansion, the second installment—Reign of Terror: The Exsularian—will either become available in this campaign as a stretch goal add on, or its own Kickstarter campaign that is scheduled to be launched in late May or early June. 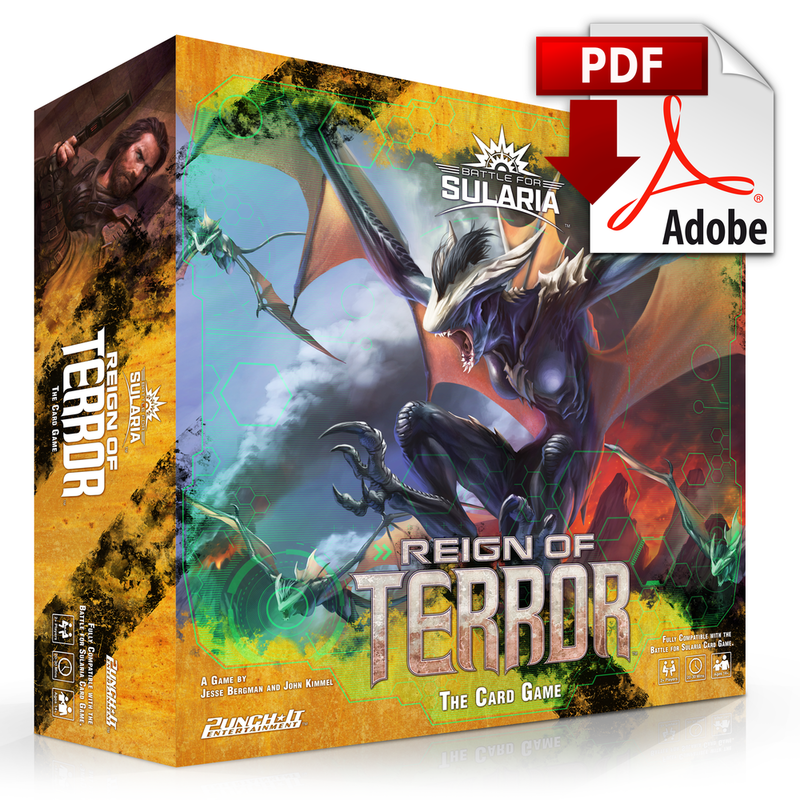 REIGN OF TERROR: ALPHA EDITION IS A DIGITAL DOWNLOAD-ONLY STAND ALONE CARD GAME AND IS FULLY COMPATIBLE WITH THE BATTLE FOR SULARIA EXPANDABLE CARD GAME SYSTEM. This digital download – print-and-play – version of Reign of Terror marks the beginning of the new Alpha Program card release cycle. Officially starting in January of 2018, the Alpha Program will introduce brand new cards every month, except for November and December, through a free PDF digital download. Reign of Terror introduces two new factions – the Protoan and Exsularian – to the world of Sularia! Whether swarming the battlefield with a relentless horde of fangs and claws or playing mind games as the cunning survivors of the wastes, the Protoan and Exsularian factions offer new twists to how you play Battle for Sularia. Along with new factions, Reign of Terror introduces new keywords and abilities! We encourage you to review our updated rule book, FAQ, and upcoming articles and videos that explore and describe all these new features. For the complete features and instructions on downloading this free digital download version, click this link—Reign of Terror: Alpha Edition.